We live in a world that is constantly changing. Technology is an area that evolves rapidly, 10 years, and even five years. The way technology moves today, what is hot today may not be hot in three months. It may even be obsolete in 24-36 months. For example, video and audio technology have changed greatly in the last 25 years. 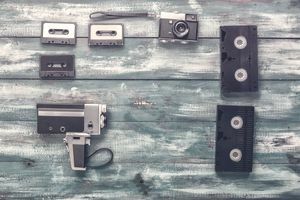 VHS tapes, camcorders, and cassette tapes are considered obsolete by the general public. But, plenty of people still use those items and actually seek them out on eBay. Technology and accessories that are obsolete in today’s world are referred to as dead tech. Images of huge console TVs, rotary phones, Polaroid cameras, cassette players, slide projectors, record players, typewriters, and Sony Walkman personal music players may come to mind. While these items are also considered vintage and collectible, the media used in audio and visual technology can be highly collectible. Surprisingly enough, some people actually use these devices and the media that goes inside them. eBay sellers often seek dead tech media products at estate sales, garage sales, and flea markets. This will probably blow your mind if you are new to eBay, but yes, people actually buy all kinds of dead tech to use for very specific reasons. These items are usually impossible to find at retail stores, so buyers and collectors turn to eBay. Bookmark this list for quick access when outsourcing for eBay. Polaroid film. This item is no longer made, but plenty of Polaroid film still exists. It may be squirreled away in desk drawers, closets, or cabinets. The best places to find Polaroid film is at estate sales or garage sales in the boxes of junk. Most people are completely clueless that Polaroid film has any value in the real world. This item is usually sold in lots of several packages, and the singles can sell for about $20 per pack. You can check out the completed listings on eBay. Typewriter ribbon. Many of you reading this probably have never even used a typewriter, much less owned one and had to buy ribbon for it. (Waving to Millennials!) Some folks still prefer using an actual typewriter rather than a computer. Those folks buy typewriter ribbon on eBay. Ribbons can go for as much as $20 each and are most successfully sold in lots. Microcassette tapes. Technology has evolved and most smartphones have a dictation, voice memo, or audio recording feature. But some people still prefer good old fashioned cassette tapes. These can sell for crazy prices on eBay. You can also find these on clearance sometimes at Walgreens or at garage and estate sales. Prices are all over the board depending on quantity, brand, and length of recording time. Find some completed listings on eBay. VHS tapes. Recording family gatherings, little league games, and other events with a mobile phone is commonplace in our society today. But VHS tapes are still good sellers on eBay. If planning to resell, choose VHS new in the package. Again, there can be a range of prices depending on brand, length of recording time, and a number of items in the lot. Always do your homework and check completed sold listings on eBay to see what buyers have paid in the past. Franklin Covey planners. Although not media, remember the era of the daytimer, or file-o-facts? The smart phone has made these items obsolete, but some folks still prefer a planner they can write in. Franklin Covey was the leading brand of daytimers but other brands are also profitable, too. Look for these leather-bound planners in the office junk section at thrift stores. You can score them for $3 or less. Some of the leather planners sell for over $100 on eBay. Take a look at the completed listings for the proof. A precaution about selling dead tech on eBay: be prepared for buyers to report that the item is damaged, dried out, or brittle. Because of the age of the vintage media, the items may very well be disintegrated or too old to use. Take the buyer’s word for it and be prepared to offer a refund or replacement.